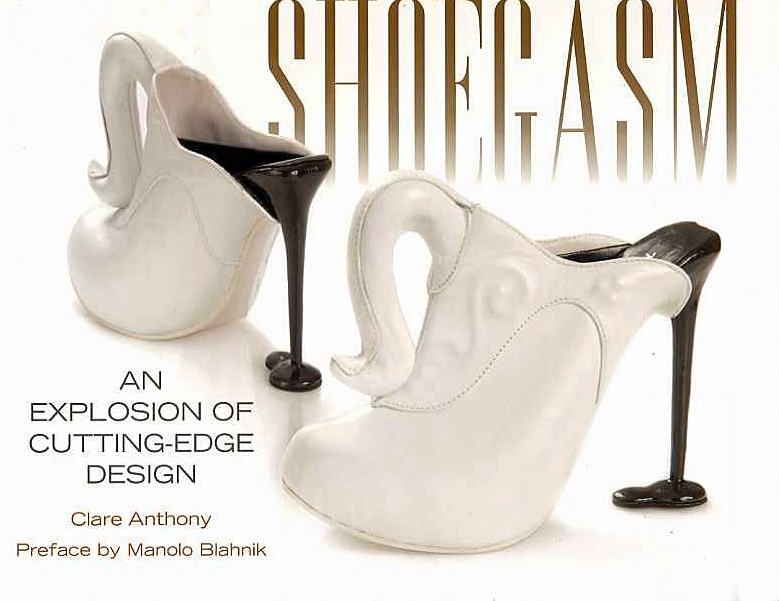 Claire Anthony's book Shoegasm, An Explosion Of Cutting-Edge Design, is a delightful history of the evolution of the shoe. The book traces the history of the shoe starting from the gold sandals entombed with the pharaohs of Egypt up until the current designers such as Laboutin and Blahnik. Platform shoes were worn hundreds of years ago in China, Japan, the Ottoman Empire and Europe. 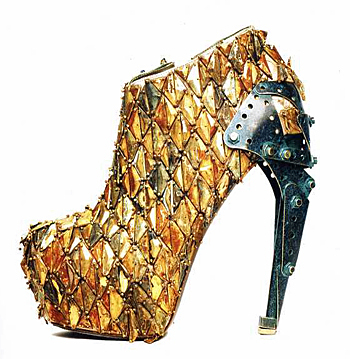 Surprisingly, in fifteenth century Italy platform shoes, called chopines, were as high as twenty inches, a figure that would make even Lady Gaga gasp. However, according to Anthony it was not until the sixteenth century that the high heel arrived in the West. These shoes were initially worn by men but slowly became a staple in the wardrobe of both sexes. Anthony's recalling of the history of the shoe is both informative and amusing. While high heels went out of style for women after the French Revolution, by the middle of the nineteenth century they came back. The first famous shoemaker was Jean Louis Pinet, whose shoes were sought out by rich aristocratic women. 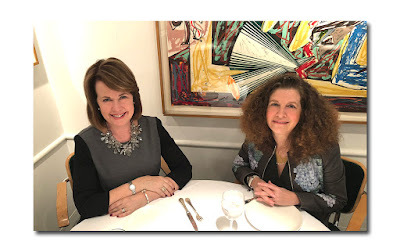 These vignettes provide an interesting framework for the next part of Anthony's book which examines current shoe designers from the early 1900's until today. The book contains hundreds of ornate photos of these wardrobe staples which adorn our feet. In the 1920's Andre Perugia came to prominence with his own footwear designs, and then partnered with Elsa Schiaparelli in the 1930's. 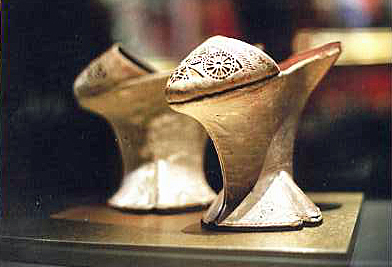 Perugia was the creator of the first towering heel-less shoe which appeared in the late 1930's. During this time Ferragamo introduced modern cork platforms and the wedge heel.The style of shoes in history is reflective of the events occurring in society, such as the advent of go go boots and flats worn in the 1960's exemplifying both the Mod trend and the bohemian era. Anthony notes that high heels came back into vogue during the 1970's by both men and women, although I can not recall my father wearing heels to work. 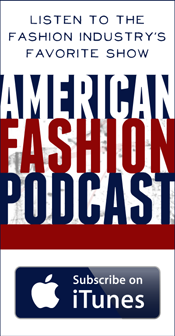 Interestingly, Anthony points out that World War II technology was used to create needle thin stilettos in the early 1950's. Anthony's documentation of the use of technology to enhance and vary modern day shoe design is illuminating. 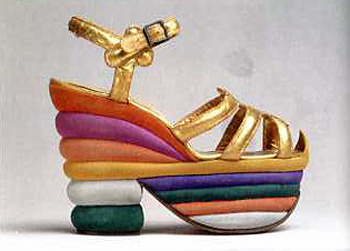 While extreme shoes have existed for hundreds of years the variety and intricacy of shoe design is at its pinnacle today. The next section in Anthony's book details the most creative and illustrious modern day shoe designers providing their professional backgrounds with accompanying pictorials and analyses of their shoes. 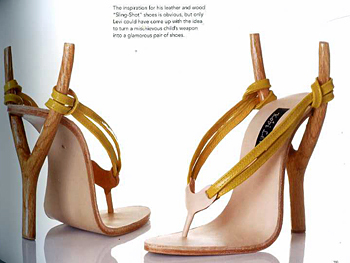 Alain Quilici, who grew up in Tuscany, views shoes as an extension and redefinition of the body. The pictures of his shoes and their construction highlight the necessity for meticulous detail in shoe construction. 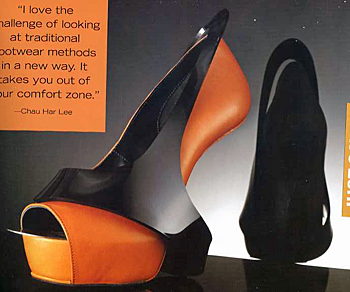 Anthony notes that many shoe designers, such as Anne Poesen and Julian Hakes, started off studying architecture and design before making shoes. Hakes an architect with a specialty in bridge design decided to apply these skills to shoe construction Shoe making is not some trivial endeavor but rather requires significant skill and expertise. Similarly complex, McQueens shoes are lauded for their "exquisite craftmanship" helping to place British fashion design back in the forefront of the industry. The magnificent patterns of McQueen's shoes overwhelm the reader into a "shoegasmic" state. Some of the shoe designers Anthony highlights are not well known however, the pictures illustrate the extraordinary creativity of these craftsmen elucidating why they were featured in this book. 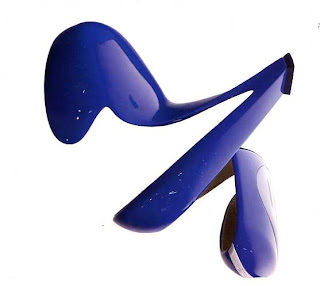 The in-depth assessment of the methods used in shoe design, such as the use by Chau Har Lee of a 3d printer to build a shoe along with laser beams and liquid resin, were of special interest to someone, such as myself, who knows little about shoe design. Laboutin'scollection is examined along with the interesting anecdote of him painting the sole of the shoe with red nail polish after finding the back of the shoe too dark. Laboutin's professional history of employment at the Folie Bergeres explains the playfulness and glamour of his designs. However, it would have been interesting for Anthony to explain why Laboutin is considered such a giant in the industry justifying his labels exorbitant price tag and extreme popularity. 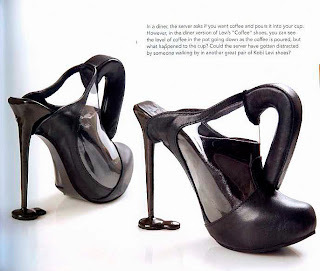 Kobi Levi, a shoe innovator who creates shoe sculptures which he crafts from start to finish, is another eccentric shoe designer highlighted by Anthony. His shoes require about a month to complete from sketch to prototype. Levi's eccentric designs which feature animals, coffee cups and chewing gum are a feast for the eyes. The title of the chapter on Manolo Blahnik, refers to extravagant comfort, and recounts how Blahnik started off as a set designer but was then urged by Diana Vreeland to switch careers and the rest is shoe history. I am not sure I agree with the term comfort to describe Blahniks nevertheless, the shoes exhibited in the book are both extremely beautiful and somewhat pragmatic. Claire Anthony's book is highly instructive to a novice in shoe design. Her examination of the shoes' history from its incipient stages as a rudimentary functional object to its current extravagance as viewed on the runway, in magazines, and on the street is both an informative and pleasurable read. The book is a perfunctory history of numerous shoe designers yet provides us with enough information to better understand the design and construction of their shoes. This book has earned a spot on my coffee table as a delightful reminder as to why I adore fashion - the vibrant colors, the exquisite designs and the eccentric playfulness is the reason retail therapy is the most effective antidote to the winter blues.